Utilization of space is a topic that comes up all the time in design critiques. Too little space between page elements and the design looks cluttered. Too much space and you’re wasting precious screen real estate. How do you strike the right balance? In layman’s terms, space typically refers to the area that exists in between objects in an area. In design, we refer to this, more specifically, as negative space (positive space is the area that is taken up by the objects themselves). In a design, negative space serves very important purposes, the first of which is to organize the interface into understandable pieces. Space is used to visually group things. Arranging separate objects in close proximity to one another suggests that they are related, leading them to be processed as a whole. Objects that are farther apart are perceived as being distinct from one another. Sensibly grouping similar objects together will help your users digest the information presented on the screen more efficiently. Consider how you might feel standing in the center of Times Square, versus if you were in the middle of the Great Plains. There is a direct connection between visual stimuli and emotional response. Studies have shown that when subjected to environments filled with distracting stimuli, people felt stressed and saw a reduction in attention span and memory. When our attention is directed and re-directed, "this alteration of focus can occur at a pace that leaves us mentally exhausted.1"
When space between objects is reduced to a minimum, more information is squeezed into view. More items in a single view means more information competing for attention, and as a result you decrease the likelihood that your users will focus on and retain what they see. Through deliberate use of space, you can better control the pace at which your users are exposed to content. In conversation we pause between ideas, using the silence between words and sentences to provide structure to what we’re saying. Think about whitespace in a design similarly, as a means of pausing (in some cases perhaps even dramatically) to help get your point across. 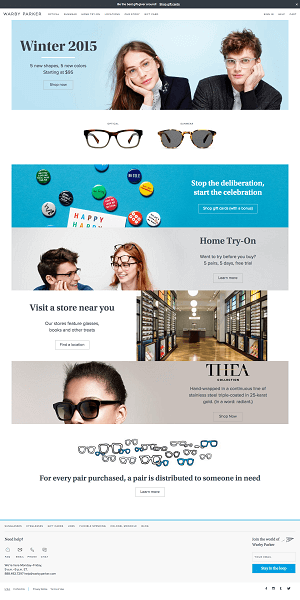 The words used commonly used to describe the Warby Parker site include “clean,” “elegant,” “modern” and “stylish.” Regardless of the words you use to describe it, the site makes a positive impression on people. Beyond that, you can see how the space and scale of the site break up the information, so that it may be consumed at a leisurely pace—a scenic stroll, or scroll(? ), if you will. It sets the stage for a user to savor the photos and actually read the messaging. It’s worth noting that this tone and casual ambiance aligns well with their brand overall. In contrast, let’s look at the same design, this time with all “excess” whitespace removed. In my experience, many website owners initially gravitate toward designs that generously utilize space. However, over the course of the design process, the open space becomes a point of contention, and sometimes even anxiety. The conversation may change based on the gut feeling that empty space equals wasted space, and that having content below the “fold” undermines the ability of the site to do its job. Now, with all the glorious space removed, more copy and more imagery are all competing for attention at once. The scenic stroll has become a crowded city street. Your eyes dart around instead of peruse. You are more likely to survey the page for an indication of what's most important, than to read the copy. With space, the quality of the photography shines through. Cropped and tightened up, the images infringe upon one another, creating a distracting visual tension. The qualities that this design exudes now compete with, rather than align to, the whole Warby Parker vibe. Space should not be used simply for space’s sake. There are certainly cases where pages are too tall; where space is used recklessly and does not serve the overall design. The trap is trying to mimic the ways that other sites use space (or the lack of it) without pausing to understand the nature of how the use space can benefit or be a detriment to your design. Hopefully this post helps you make a more deliberate use of it! As WSOL’s Design Director, Dennis focuses on helping clients realize the importance of user-centered design and developing elegant and intuitive websites. He is responsible for collaborating with clients to flesh out the vision for their project, running UX and discovery workshops, and working between teams to ensure that visually, conceptually, and functionally, each project lives up to its potential. Dennis has over 12 years of combined experience in visual design, user experience, and web development. He is a recognized speaker, writer, and contributor within the UX and web design communities, and is obsessed with topics like responsive design, the mobile web, and design ethics.